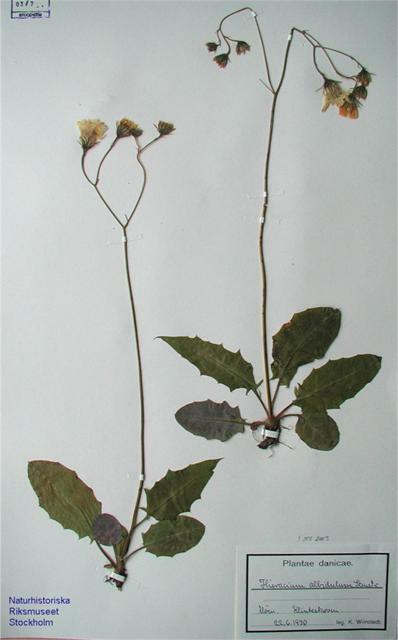 This species is characterised by leafless stem and by narrow upper part of the phyllaries, the latter have a margin of stellate hairs and a tuft of tiny hairs in the apex. A very rare species in Denmark only known from Møns Klint. Hieracium albidulum (Stenstr.) Johanss. & Sam. Johansson, K. & Samuelsson, G., 1923: Hieracia scandinavica exsiccata 7. Basionym: H. silvaticum ssp. albidulum Stenström, K. O. E., 1889: Värmländska Archieracier. Uppsala. p. 18.